This d-sub product range is rated to IP67 and can be mated to standard D-SUB Standard and D-SUB High Density connectors. Whether they are used in traffic guidance systems, photovoltaic systems, building machinery, supervision cameras or offshore wind farms ­ modern industrial applications place high demands on the connectors used. Conec’s UL and CSA Approved waterproof D-Sub miniature connector ‘system’ includes standard D configuration as well as High Density, mixed layout, and Filtered options, all of which can be used in applications where moisture, high humidity, water or dust could be a problem. IP67 connectors must allow no ingress of dust with complete protection against contact. They must also prevent ingress of water in harmful quantity when immersed in water under defined conditions of pressure and time. IP67 is intended for applications that will get ‘rained on’, or occasionally washed/drenched. They are not intended for use under continuous pressure. In consideration of the broad range of ‘rained on’ definitions, the industry appears to have agreed to a ‘test of immersion for 30 minutes, at a depth of 1 metre, or the equivalent air test at 1.45 psi. That is the Qualification Test. (Protected against the effects of temporary immersion between 15cm and 1metre. Duration of test 30minutes). 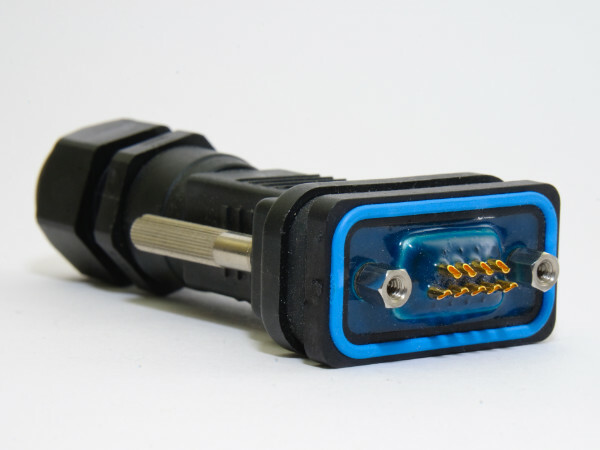 The connector contacts are rear sealed to the shell, which means that d-sub socket and plug connectors are available with solder cup, straight or right angled PCB, but not “crimp” contacts. Designed with a one piece Solid Body zinc diecast housing to resist mechanical impacts during installation and operation and minimise possible leakage paths; these connectors comply to current solder requirements with RoHS compliant solder temperatures. The solid body, one piece housing offers optimal protection in the vicinity of high mechanical stress. Available with Zinc diecast solid frame with O-ring for front or rear sealing of d-sub connector to panel. This robust design performs better against mechanical impacts during installation and operation and has less possible leak paths, making it ideal for applications such as industrial machinery, medical equipment, test and measurement equipment and communications. These connectors are also known as watertight d-sub connectors and hoods, water proof d sub connectors, water tight d-sub connectors, waterproof dsub connectors and hoods, environmentally sealed d-sub connectors. DIN 41652 and MIL-DTL-24308 D-Sub waterproof connectors are intermateable and interchangeable with standard non-filtered connectors from all quality connector manufacturers. 6 = Complete protection against contact with live or moving parts inside the enclosure. Protection against ingress of dust. 7 = Protection against immersion in water. It shall not be possible for water to enter the enclosure under stated conditions of pressure and time. Because of the wide range of configurations available, these waterproof connectors are built to order. With this water resistant d-sub system, the back-potted and ‘O’ ring mounted panel connectors always ensure full IP67 conformity whether mated or unmated and in especially harsh environments can be further protected by an waterproof end cap when unmated. The mating d-sub cable end connector can have a waterproof hood as shown in the colour picture above. This has a compression ring to stop the ingress of water via the cable entry point at the rear and a sealing skirt at the connector interface to prevent liquids from reaching the connectors. The fitted jackscrews are sealed with O rings. The cable-end connection will not itself meet IP67 when unmated unless a waterproof cap with an internal rubber seal is fitted. Once mated, then the total d-sub connexion interface, not just the panel mount dsub connector will conform to IP67. (Please note that if the hooded connector is to mate with a FRONT MOUNTED waterproof panel connector, a replacement sealing skirt for the hood ~ ordered separately ~ is required to achieve IP67). Unless the sealing skirts or other forms of IP67 protection are added around the interface of the two connectors, any moisture getting into the mating zone could track across the pins and cause shorting.